G.K. Chesterton once wrote: "It is of the new things that men tire... of fashions and proposals and improvements and change. It is the old things that startle and intoxicate. It is the old things that are young." This was the paradoxical justification Chesterton gave for his (and many others) perennial fascination with the Catholic Church and her philosophy. There is something quite extraordinary about a thing that is so old and yet remains young; or put another way, a thing that is so eternally youthful that it manages to outlive the trends, movements and passing philosophies of each age. It is an ability, or rather a gift, that too many non-Catholics ignore and far too many Catholics forget. In any case, most people are blind to it today and it should be more often acknowledged, as it was by Chesterton one hundred years ago, and will be again one hundred years from now. But there is a special reason for bringing it up at this particular moment: the resignation of Pope Benedict XVI on Monday, February 11th. The announcement shocked the Church and the world and did so precisely because of the contemporary malaise I just mentioned. The Church and the world do not often see eye-to-eye on matters concerning the human family, but they did see eye-to-eye on this, in that they didn't see it coming at all. For the moment, the secular world and the People of God are standing beside each other, eyes wide and mouths open. And the reason for it is simply that collectively we do not believe that the Pope or the Church is capable of such unprecedented actions, or that it is as youthful as it actually is (youthful in the sense that it can change and adapt quickly; that it is still full of surprises). The Pope's announcement did come as a surprise, but we were not surprised by the announcement, we were surprised by the surprise. How could a thing like the Catholic Church - a thing that is so "old and outdated," a thing that "moves backwards" and "never changes" - how could this thing be capable of doing something so new? Like many questions of this nature the answer can be found in our own history and tradition, and in this case we do not need to look back very far to find it. When Pope Benedict made his recent announcement, the scenario which immediately came to my mind was Pope John XXIII calling the Second Vatican Council in 1959. John had only been elected three months prior to this announcement, and the historical records show that it really did come as a complete surprise to everyone, not least to the Cardinals of the Roman Curia who are considered the pope's closest affiliates. The Council (1962-65), which came to be seen as a new springtime for the Catholic Church in modern times, was born from what John himself called a "great inspiration." Now, we can all agree that moments of "great inspiration" don't seem to happen very often in the Catholic Church. Practically speaking, there have only been twenty-one ecumenical councils and a handful of papal resignations in our two-thousand year history. So in that sense it's natural to juxtapose the call for Vatican II with Benedict's resignation. But in another sense it's very unnatural. Most people who know even a little bit about John XXIII and Benedict XVI would immediately assign them to opposite ends of the ecclesial spectrum. Developments inside and outside the Church over the past fifty years have shaped our image of John as a great "progressive," much the same way as they have shaped our image of Benedict as a great "conservative." I am not suggesting that these depictions are accurate, only that we tend to invoke them precisely in relation to the other: John to Benedict and Benedict to John, and both in the greater context of the history and significance of Vatican II and its ongoing implementation. But I find this to be a very superficial understanding of both men, of the Council, and really of the whole Catholic tradition. We have adopted the terms "progressive" and "conservative" from the culture because it's convenient, and that's okay for arguments sake. But "progressive" and "conservative" mean different things to different people; it all depends on your point of reference. And this is where we should be careful in our labeling of these popes and of the Catholic tradition in general. On the surface, John calling the Council and Benedict resigning appear to be rather "liberal" decisions for the reason I outlined above: people do not believe the old, deep-rooted Catholic Church can change. 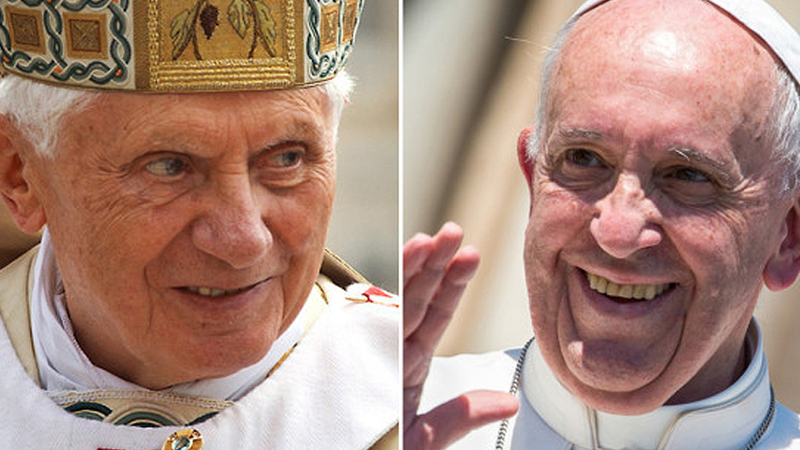 So how are we, Catholics and non-Catholics, to understand the actions taken by these two popes—actions that have thrown a wrench into this common contemporary perception? What these "liberal" decisions really are, are profound professions of faith. You do not need to be a progressive or a conservative to be a disciple of Jesus Christ, but you do need to have faith, which in the end is all there is. And it seems to me that both John's decision to call the Council and Benedict's decision to resign were, at their deepest levels, supreme acts of faith and trust in God. That is why the initial shock of the announcement, the momentary disbelief, the mad rush to prepare, and most importantly, the very serious concerns about the future of the Church—all these things in a sense became trivial when at a decided moment these two popes, each in his own humble way, removed himself from the spotlight to make way for the Holy Spirit. When this becomes clear, we see the deeper, richer meaning of conservatism and progressivism within the Church. The truth is that both John and Benedict were great "conservatives." They sought with all their body, mind and heart to conserve the message of Jesus Christ and the Catholic tradition in their time. But we have misconstrued the authentic definition of tradition, which literally means "to pass on" or "to hand over." If you want to conserve or maintain something, you must share it, you must pass it on to the next generation, you must in a sense give it away. The surest way to destroy the Church is to hold on to the past, to exalt the structures, legalisms and even the spiritual practices that have been in place for centuries, simply because they have been in place for centuries. That kind of tradition is not a living tradition. For wisdom and guidance we look to the past, but solely for the purpose of progressing into the future. By their remarkable actions John and Benedict have taught us the real meaning of tradition. The result of John's calling the Second Vatican Council was nothing less than the powerful in-breaking of the Holy Spirit on the Church, a "new Pentecost" lighting the path for the future. The Council Fathers have testified to this in their journals, but also in their episcopal ministries and ecclesial outlook. The result of Benedict's decision has yet to be seen, but we cannot look past the fact that his resignation has all the appearances of one of those singular moments in history when the Holy Spirit comes mightily upon us. 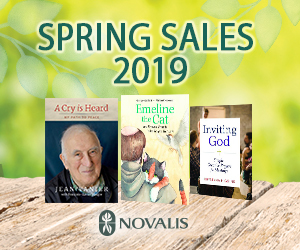 I wouldn't be surprised if fifty years from now we look back at February 11, 2013 as the beginning of a truly life-giving moment for the Church and the world, when no one really expected it. 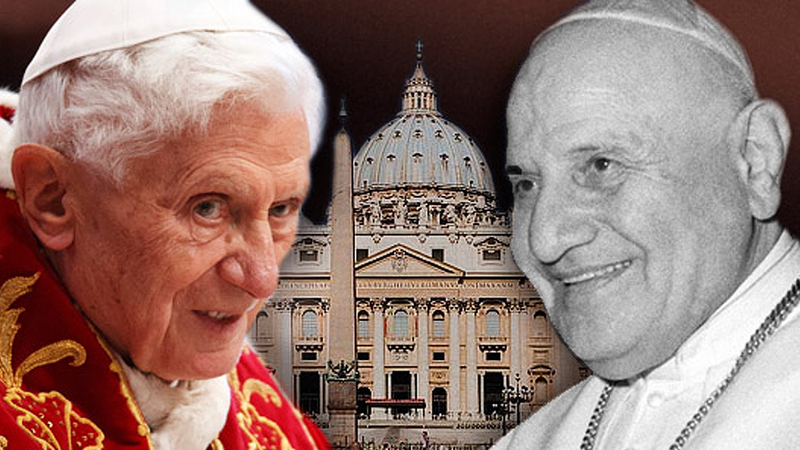 I only pray that we, the People of God together with the College of Cardinals, have the same faith and courage as Pope John and Pope Benedict. This is no time to be afraid.